A K-9 with the Green Bay Police Department was stabbed multiple times on Saturday night during a call about a man with a gun. Image courtesy of Green Bay PD / Facebook. 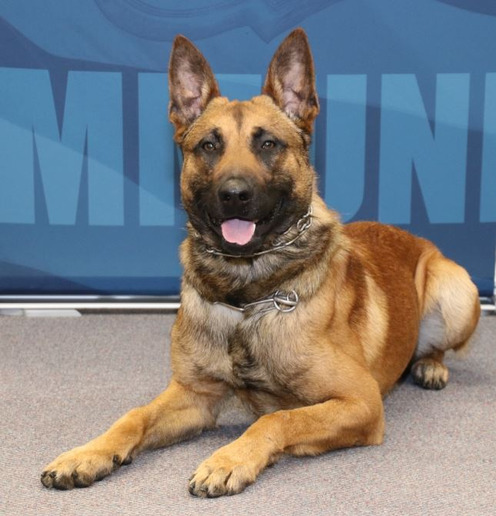 A K-9 with the Green Bay (WI) Police Department was stabbed multiple times on Saturday night during a call about a man with a gun. Pyro was transported to a nearby hospital where he underwent initial surgery. He was then taken to a veterinary clinic for additional treatment. The agency said on its Facebook page, "Good Morning Titletown. Please keep our K-9 Officer Pyro in your thoughts and prayers today. He is continuing to receive medical treatment for the injuries he suffered last night in the valiant performance of his duties." The agency said in an update, "Pyro is out surgery and has serious injuries to his esophagus which pose the greatest danger to him. His veterinarian says that the next 24 hours will be critical. It is hoped that if he continues to recover that he may return home to continue recovering with his handler and family."